Cardo has put out a great promotional video for the new G9 headset. It probably will not make it to Cannes, but it does inject a little bit of humor into what could have been a boring video full of tech specs. We were informed today that the Cardo Scala Rider G9 Bluetooth intercom will be in stock this Friday, get your orders in today, there has been a lot of interest in this headset. It features some noticeable improvements over the G4, such as the ability to pair with up to 9 headsets together and toggle between the headsets via voice command. Also there is a new pairing option, to pair the G9 to another G9 via tapping them together known as flash pairing. No word yet on how much of this will be backwards compatible with the Scala Rider G4. Sena has come to the rescue of snowmobile riders everywhere. 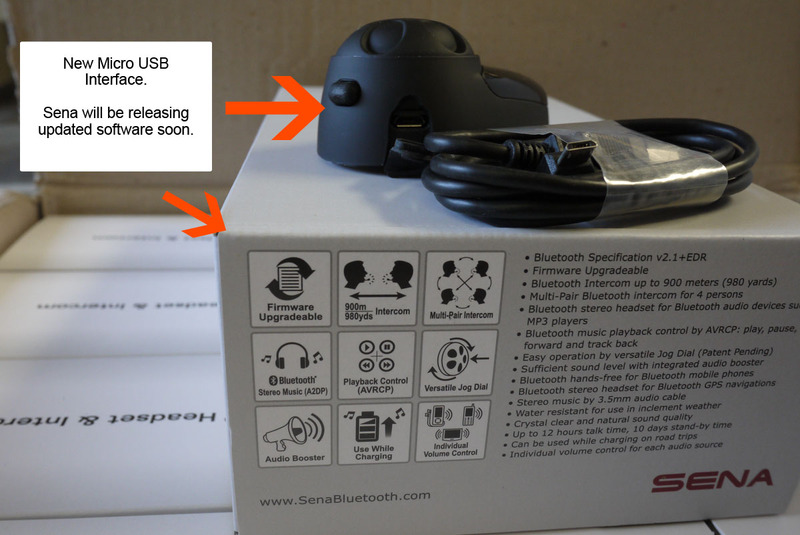 The SMH10 comes with everything the standard kit does (except for a AC wall charger) instead it has the detachable microphone clamp (SMH-A0302). Which includes the soft wire microphone which is ideal for use with a breathbox. 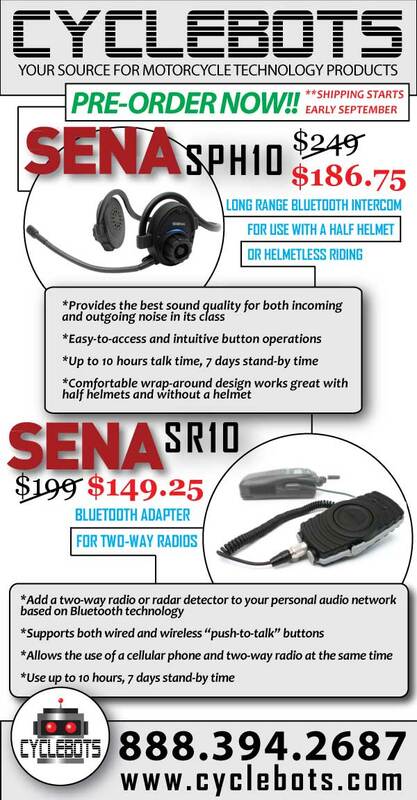 The SMH10 Dual Pack for Snowmobiles is a special package including a pair of Bluetooth v2.1+EDR Class 1 Stereo Headsets with long-range Bluetooth Intercom designed specifically for snowmobile riders. The product is snow/water resistant and designed to endure cold weather environment. It includes wired microphone or attachable boom microphone for modular type snowmobile helmet. The SMH10 Dual Pack for Snowmobile supports a two-year International Warranty for the peace of mind of all customers. The list price is 399 USD for dual pack and it will be shipping available from November 7, 2011. 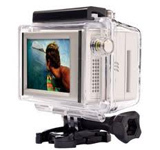 Cyclebots is offering a free LCD BacPac with purchase of any GoPro HD Camera in the month of November. Cameras will be shipping in approximately 2 weeks. Date added: 12 Aug 2011 Sena SR10 and SPH10 Available for Pre-order! Cyclebots is now shipping the latest version of the SMH10 with a micro usb port that will allow users to upgrade firmware, (not yet available) from Sena. This is a welcome change as many phones and other portable devices use this standard connector. Cardo has released new firmware for the G4, which we are now shipping. If you have an older version you can get the upgrade here. The specs are below, the most interesting item to us is the ability to click to link. This will let you click to any rider with a G4 within range. We believe this will help eliminate, the need to yell at someone at a stoplight "nice bike" or "watch out for that cop behind us". Specs are below. Since several hundred thousand bikers are already using the G4, a new and exciting feature has been added to allow for spontaneous intercom connections with any G4 biker within sight: Click-to-Link™. No need for advance pairing or any preparation. Just “Click-to-Link” and create your own roadside social network. The Click-To-Link feature allows bikers to initiate spontaneous intercom calls to random G4 users who are within range. Users can always activate or deactivate this feature and choose to accept or reject incoming requests for such random connections. The Volume Per Mode feature causes the G4 to memorize the most recently stored volume setting for each audio source (A2DP stereo, mobile phone, GPS, FM radio), so that whenever a user switches between modes, the G4 will automatically transmit sound at the previously set volume level. A dedicated audio channel was added to accommodate A2DP-enabled music devices (such as the iPod Touch 2G/3G/4G). This provides the G4 with parallel connectivity to an MP3 device and a mobile phone, so that users can seamlessly switch from one to the other. AGC sensitivity levels can now be set according to any user's particular needs (Low, Medium, High) and can be re-adjusted whenever needed. Users can now set the optimal AGC level to accommodate their personal needs and adapt to specific driving conditions, thus avoiding excessive or insufficient AGC responsiveness. Users will set and/or readjust their desired AGC sensitivity levels as needed via the PC software or in the Voice Configuration Menu directly on the G4. VOX sensitivity levels can now be set according to the user's particular needs (Low, Medium, High) and can be adjusted by the end user whenever needed. The end user will be able to set the optimal VOX level for specific driving habits (lower VOX sensitivity for fast driving, etc. and vice versa) via the PC software or in the Voice Configuration Menu directly on the G4. One-Button-Push to search for and temporarily set up to six radio station presets: For users travelling outside their home region. To reactivate their original six station presets after returning to the home region, users just need to turn the unit off and on again. Automatically scan for the next available station. If the user finds a station he wants to listen to, one press of a button will stop the Scan before the system continues to automatically search for the next station. … of course you can also choose to configure these settings via the PC software.